Paintings in the Indian history hold a a very special place. Paintings are the visual creations of many concepts. 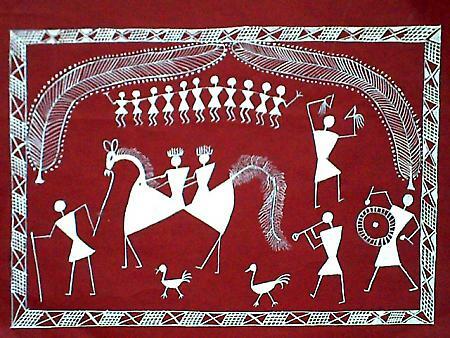 Warli paintngs belong to the tribal comminity and this goes back to the BC era. It is believed that this came into existence somewhere between 2500-3oooBC. This art is done in a very traditional way . First the coating of cow dung is done on the walls and to brighten up the shade mud is polished over it as a primer coating. Rice powder and straw are the main mediums used for paintings which is then mixed in a traditional metal vase and with the thin sticks prepared out of Beharu tree are used as a source of painting. The paintings have compositions of human figures as well as animals , insects and birds. Interesting to know is that the lady whose husband is alive can only draw the main elements of the composition. The main element is the mother goddesses Palghata. Today this art is not only limited to walls but also on papers and is available for purchasing.